For parents and family members the Tupper Lake Skating Club's holiday pageant on ice Thursday was a spectacle of popular holiday pieces and young skaters swirling about to them in very colorful costumes. 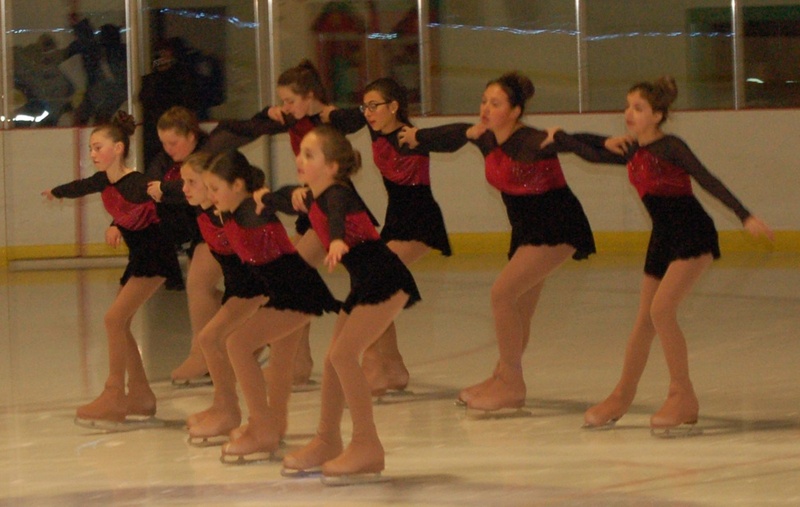 A contingent of advanced teenage or near-teenage skaters opened the show at the Tupper Lake Civic Center by skating to the very moving Silent Night. Those accomplished young skaters included Aileen Cote, Angeleigha Giacovelli, Shannon Soucy, Izabella Stalhammar, Stephanie Fortune, Olivia Ellis, Taylor Stoll, Marissa LaMare, Julia Chapin, Madelyn Logie, Patricia Bankich, Jami Hubbard, Leah Whalen, Patience Nelson and Kiera Levitt. The Basic 1 class was the next to perform, under the direction of Jr. Coach Marissa LaMare and helped by Taylor, Leah, Olivia, Kiera and Izabella from the Advanced group. The tiny ones stepped lively and swirled to the music of Do You Want to Builda Snowman. The tiny ice dancers included Ella Combs, Ava Facteau, Lylah Fuller, Sidney Howard, Morgan Lohr, Charlotte LaQuay, Alyssa Pickering, Scarlet Gravlin, Elizabeth Kohan, Josie Desmarais, Chelsea Kohan, Arabella Colbert, Memphis Collegian, Emma Gnann, Jeanelle Lizotte, Isabel Tessier-Day, Angel Bujold, Heather Schaeffer, London Marquis, Eliza Bujold, Kaileigh Dukette and Fern-Marie Henning. Twelve tiny soldier-like skaters in military-style costumes performed March of the Wooden Soldiers, under the direction of Jr. Coaches Angeleigha Giacovelli and Stephanie Fortune. The Basic 2 skaters in that number were Brianna Towne, Lacey Tarbox, Payton Stevens, Adrianna Dattola, Vivian Allen, Odelia Combs, Genavieve LaScala, Charolet Pickering, Rena Reandeau, Lyla Robillard and Alivia Benware. Before a short break, the club's Synchro Team of accomplished skaters performed a classy version of Feliz Navidad, a favorite of the season. They spun and swirled in time with the moving piece. The Synchro skaters were Ashleigh Flagg, Taylor Stoll, Olivia Ellis, Camille Cuttaia, Alexis Callaghan , Elli Dukett, Shae Arsenault, Sierra Welch, Izabella Stalhammar and Kendall Kenniston. After the break when raffle prize winners were announced, the Basic 5 skaters had the local rink rocking with Rock Around the Christmas Tree. Working under Jr. Coach Madelyn Logie, the young skaters moved with ease across the ice surface. The members included Tayler Labarge, Jordyn Gagnon, Raegan Fritts, Kiana Reandeau, Abbygail Stalhammar and Katherine Barkley. The pace stayed upbeat the lively in the new song and performance Jingle Bell Rock performed by the Basic 4 group, with assistance from Jr. Coach Julia Chapin. The Jingle Bell Rockers were Emilie Schuller, Campbell Casagrain, Emma Daniels, Kelsey Dewyea, Aubriana Giacovelli, Alexa Lindsay, Gabrielle Staves, Kendra Levitt andMadelyn Richardson. A free skate to the tune of Santa Baby wasperformed by some of the more polished skaters- Shae Arsenault, Elli Dukette, Lauren LaMere, Ashleigh Flagg, Denali Giacovelli, Kendall Kenniston, Sierra Welch and Hayleigh Conlon. The Basic 3 group ushered in Santa Claus is Coming to Town with the help of Jr. Coach Aileen Cote. Skating in the group were Lily Chase, Liza Crouse, Samantha Flagg, Sarah Higgins, Khloe Hyde, Rylee Labarge, Sophia Nadeau, Leann Stevens, Sadie Tower, Rylee Preston, Sophia Staves, Jenny Russell and Brianne Towne. The Advance skaters were the second from last numberwith their rendition of All I Want for Christmas before the rink was filled with all the skaters in a big We Wish You A Merry Christmas close. Like all the local skating club's pageants, Thursday's show was well orchestrated, well planned and delightfully performed.